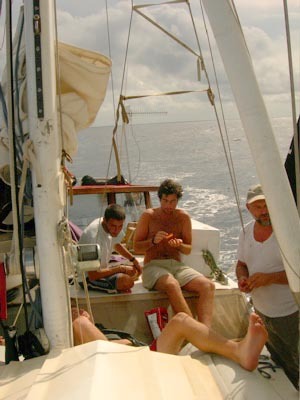 Where we lived for almost 50 hours on board the Melody en route to Colombia. Thank you Captain Mark Matson. 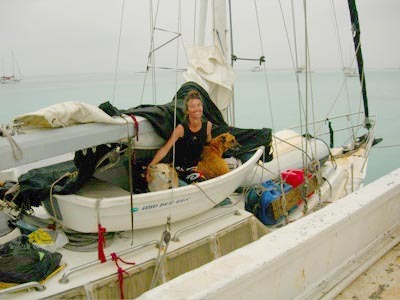 Both dogs hate the water, but I thought if the three of us were together, it would be better than flying them in the cargo area of a airplane. The jury's still out.... As I suspected, neither peed or pooped the entire way. It's repugnant for a dog to defecate in the place it considers home. 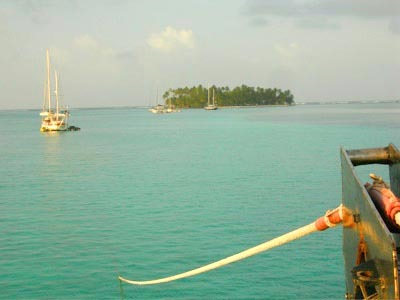 There were nine passengers on board the 44 foot yacht along with Captain Mark and his wife Paola. 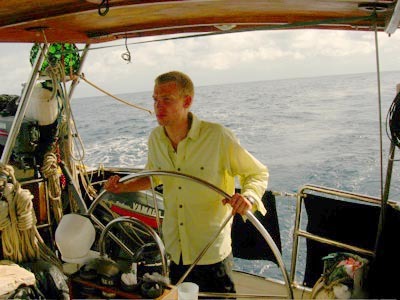 Captain Mark of the Melody began his life on sailboats at the age of six when his parents decided to sail around the world. Though Mark has taken plenty of motorcycles, he'd never had dogs on board and though slightly wary, decided to try this as an experiment. Fortunately, he didn't regret the decision and was surprised at how well-behaved Dog and Bruiser were. Paola takes the helm. 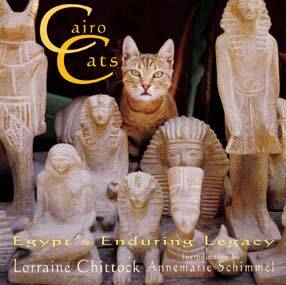 Born in Cartagena, Colombia, she made many fans on the trip with her cooking, beauty and vivaciousness. 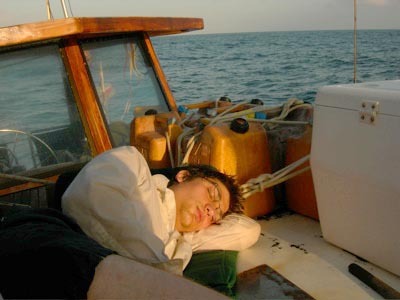 Anthony sleeping as a way to combat seasickness, to which four of us succumbed. I was a bit embarrassed by this, as I spent a lot of time as a youngster on my Dad's sailboat. Enjoying the afternoon sun and sail. Said Jordon, whose legs and feet you see here, "I think I'd really enjoy sailing if I wasn't puking every half hour....." What a trooper. 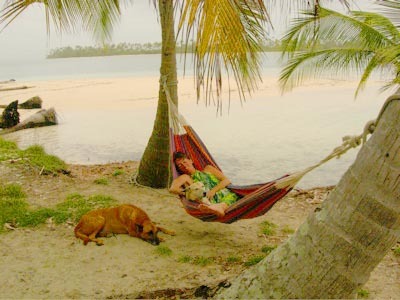 Twelve hours after leaving from Portobello, Panama, we arrived at the San Blas islands. 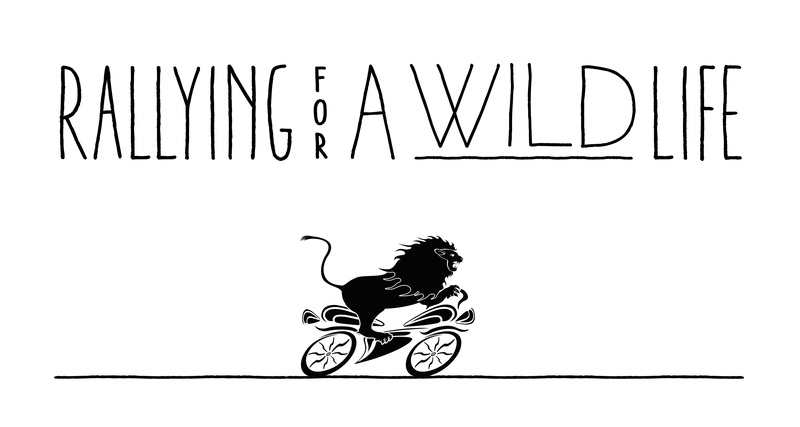 They say opportunity comes to those who are prepared. 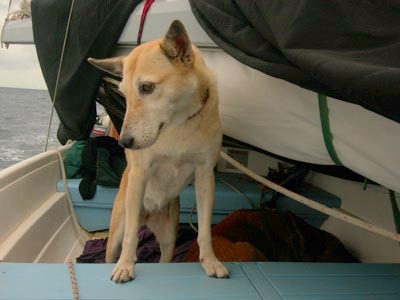 Mark took me and the dogs to the closest island so the dogs could pee and poop while the others stayed on his shrimp boat. As soon as I stepped foot on the island I thought, "Myself and the dogs, all alone on an island..." We stayed there for the next two days and three nights. The dogs and I began each night outside under the stars, but always at some point in the night it would begin to rain and we took shelter in this hut made by the Kuna tribe. Dan and his dog from Alabama were one of my visitors. 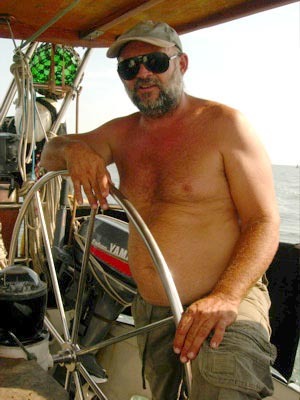 He retired four years ago and began sailing south. 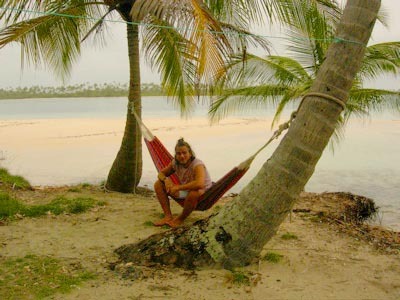 He'd been in the San Blas islands for six months, one of about 12 sailboats which came and went. This was a self-portrait. After I triggered the shutter for the next shot, I dove into the hammock at the wrong angle and ended up on the ground! 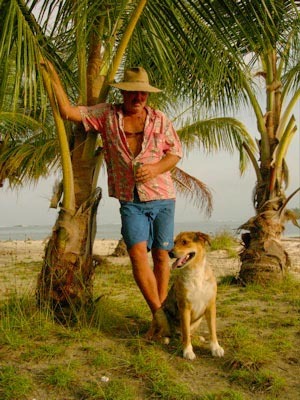 Steve Majer, a Belgium responsible for almost all the shots of me and the dogs. 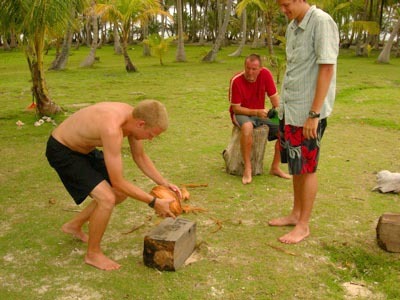 Allen breaking open a coconut while watched by Jordan, another American, and Jean-Claude from France. Saras from Mauritius enjoys eating the free spoils. Jean-Claude and Saras also have a Chevy van they're traveling with. 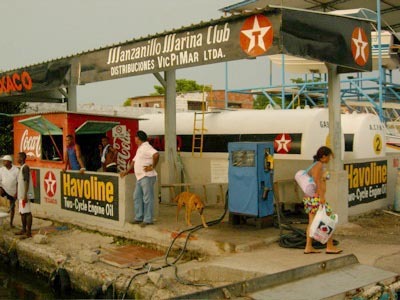 Unfortunately, when we went to collect our vehicles in Cartagena, they discovered their vehicle hadn't been shipped and they had to wait another week. 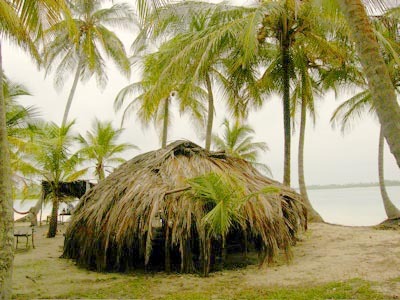 The island had been cleared by the Kuna people who collect the coconuts. 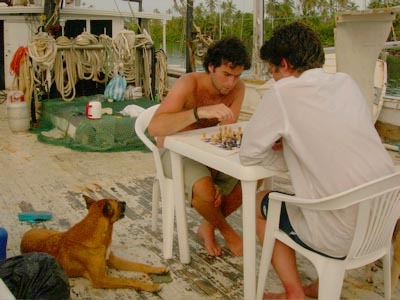 Raphael from Belgium and Anthony play chess on the shrimp boat. 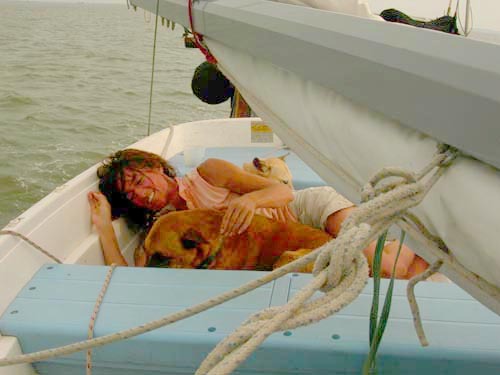 Bruiser didn't mind this boat at all. 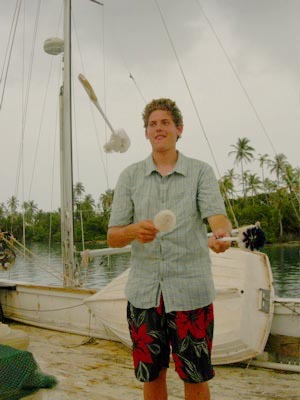 Jordan Mann, who entered us all with his wacky and wonderful ideas, juggles with toilet bowl cleaners on board Mark's shrimp boat. 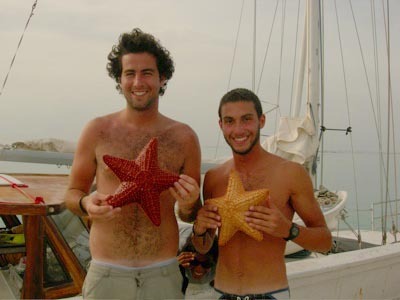 Yoni Ajdler and Raphael Moz, both from Belgium found two starfish while snorkeling. The starfish got tossed back after the photo. 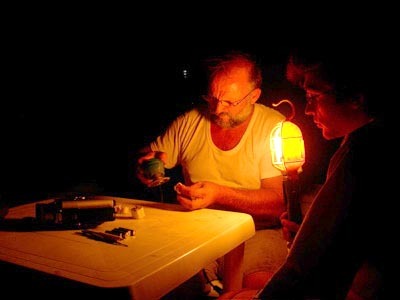 A jack of all trades, Mark fixes Anthony's video camera. Paola securing the mooring lines when we docked in Cartagena.